At approximately 10:45 p.m. last night, August 3, 2018, Sheriff’s Detectives from the Special Investigations Bureau, while assisting the Santa Barbara Police Department with saturation patrols, conducted a traffic enforcement stop on a vehicle speeding in the area of E. Cota and N. Salsipuedes St. During the stop, a passenger was found to be in possession of a methamphetamine pipe and hypodermic syringes. 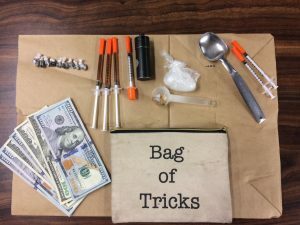 Following this discovery, additional searches were conducted and nine bindles of heroin totaling approximately 6 grams were located, along with three heroin loaded hypodermic syringes, 8 grams of methamphetamine, and $700 in cash believed to be related to illegal narcotics sales. These illicit items were located both inside the vehicle and on the persons involved in this investigation. At the conclusion of the stop, the following suspects were arrested for the listed charges: The driver, 58-year-old Francisco Paz of Santa Maria was arrested for transporting heroin for sales and possession of drug paraphernalia; 56-year-old Debra Flores of Santa Maria was arrested for possession of methamphetamine; 42-year-old Joaquin Robles of Santa Maria was arrested for possession of drug paraphernalia; 32-year-old Dolores Galindo of Santa Maria was arrested on a probation violation. All subjects were booked into county jail without incident.